Select the task in which you want to create a subtask. At the right side of your screen, where all information related to the selected task is available, add your subtask by selecting the text field of Add subtask. Add due date by clicking on date picker. Click Assign people icon and a window will pop up from where you can select people whom you want to assign the subtask and click Add. Hit Enter and your subtask will be added. Select the subtask which you want to convert into main task. 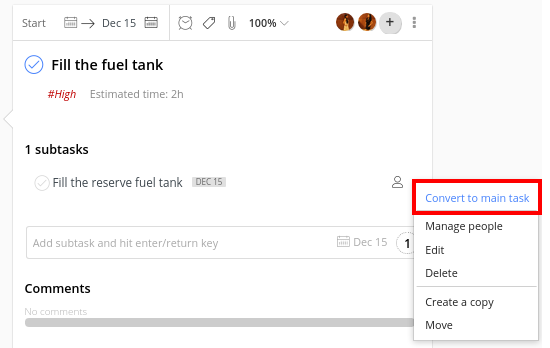 Click on the menu icon present on the right side of your subtask detail screen and choose convert to main task. Your subtask will be converted into main task. You can also drag a subtask to convert it into main task and vice-versa.